ARCADE has two independent modulation sources. Each source can be either a step sequencer or an LFO. On the far left-hand side, you can select a modulation slot and set it to an LFO and/or StepSequencer via the center dropdown menu. Simply click on one of the slots to view and edit the settings (the actively edited modulation slot will appear darkened). Next to the modulation sources, you’ll find a scrollable overview of all the Modulation Assigned Parameters. This overview will list out all of the parameters that are being modulated by the selected source. You can edit the range/depth of each modulated parameter, change the original (unmodulated) value, or remove the modulation connection altogether. 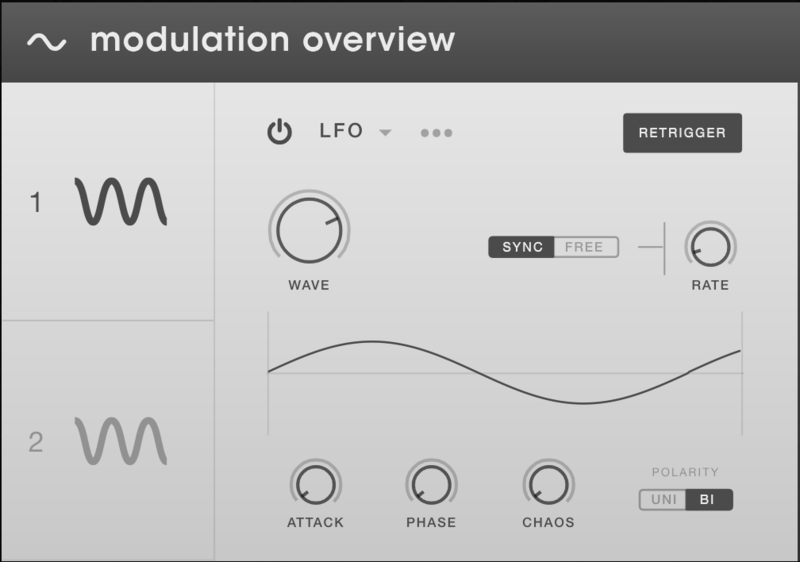 Tip: Modulate the rate of one modulator by the other for interesting “flux” effects. To assign modulation to a parameter in ARCADE, simply right click on a knob or slider and select the modulation source that you’d like to connect to the parameter. Once you’ve selected the mod source, dial in the strength of modulation (aka modulation amount) by click + dragging up or down. Drag up to set mod amount with positive polarity (right-left modulation of the parameter), or down for negative polarity (left-right modulation of the parameter). The mod amount is indicated by the dotted white outline around the knob, and the dancing white dot indicates the active modulation.